The National Museum of Singapore and Ministry of Social and Family Development will be presenting MSF Families for Life: My Family Weekend. Head down to the National Museum of Singapore with your family and enjoy the many activities planned! 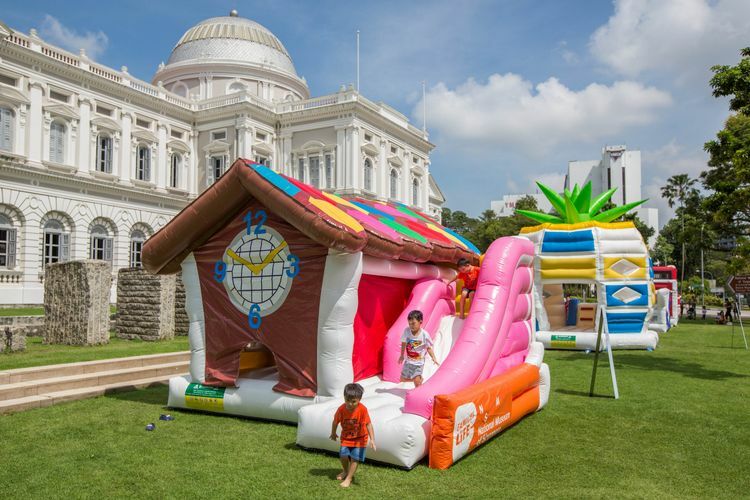 Embark on a bouncy adventure with interactive inflatable playgrounds that are inspired by iconic mosaic playgrounds of yesteryear! You can also go on an “animal hunt” with animal springers for more fun. All that bouncing got you hungry? Check out the food truck at the Front Lawn of the National Museum. Enjoy complimentary light snacks and drinks from the Families for Life mobile café! Or check out the kombi ice-cream van brought to you by Scoopy’s & Cream and get $1 off your ice cream with the museum entry sticker. Sit back, relax and enjoy some movies. The National Museum’s Young Cinema programme returns with TimeScapes – A Singapore Anthology, a collection of animated short films about life, love and the landscapes of Singapore past and present. Round up the kids and head down to the National Museum on 1 September 2018 to enjoy all these activities and more.